"A garden is only as rich and beautiful as the integral health of the system; pollinators are essential to the system - make your home their home." The goal of every living organism is to reproduce, and one of the ways plants achieve this is by creating seeds by pollination. Pollination is the transfer of pollen from the flowers male anther to the female stigma of the same or another flower of the same species so the plant can produce fruit and seed. Although some plants obtain pollination by cross pollination (98% wind, and 2% water), or by self-pollination, the majority, over 70% of plant species rely on pollinators to transfer the pollen for successful reproduction. Pollinators worldwide, include not only honeybees, but native bees, wasps, butterflies, moths, flies, gnats, a mosquito (Aedes communis), some true bugs, slugs, beetles, ants, birds, and in warmer climates, lizards, geckos and skinks can be pollinators. In addition to these, animals are known to be pollinators, including rodents, lemurs, the honey possum of Australia, and some small marsupials. Bees are the most effective insect pollinators and are clearly adapted to pollination. They are typically fuzzy and carry an electrostatic charge, helping the pollen to adhere to their bodies. Most bees also have specialized pollen-carrying structures on their hind legs or abdomen depending on the species. As the bee flies from flower to flower, the pollen grains are transferred to the stigma of other flowers. The honey bee will be covered elsewhere, however, our native bees do a great job of pollinating! Native bees that provide pollination include the bumblebee (genus Bombus), carpenter bees (Xylocopa virginica and other species), sweat bees (family Halictidae) and mining bees (family Andrenidae). Bumblebees are probably the most widely known of our native bees and forage on a wide variety of plants. They work hard and love clover. You can help them by allowing clover in your lawn, and leaving some leaf litter for the queen to over winter in. Carpenter bees are usually deemed a pest by homeowners as they are attracted to weathered wood, but only occasionally cause minor damage to wooden buildings. You will recognize them by their large size and metallic shiny luster. Unlike most native bees, carpenter bees begin to get active only after the air warms to about 70 degrees. Males are unable to sting, and the females rarely do so. Sometimes they go directly to the nectar by tearing a hole into the base of the flower, bypassing the pollen, but despite the occasional use of this short cut, they remain valuable pollinators. Sweat bees are fuzzy dark brown to black, and many are a pretty metallic green. They are attracted to sweat, as their name suggests. These small bees are easy to miss, but are quite common and nest in the ground. They are not aggressive; if they sting at all, it is minor. All species of sweat bees are pollinators. Mining bees in Massachusetts are typically hairy, and are brown or black. They dig burrows in the ground with sparse vegetation and in lawns. They are not aggressive and seldom, if ever, sting. They are good pollinators, as the female deposits an egg on the pollen and nectar she has stored within cells in her burrow. Like bees, wasps are a high energy insect and feed on nectar. Unlike bees, they are not covered with lots of fuzzy hairs that pick up pollen, although most have some hairs. Thus, they are much less efficient as pollinators because the pollen is less likely to stick to their bodies and be transported by the wasp from flower to flower. Also, unlike bees, most wasps do not feed their young pollen or nectar. The one exception is a pollen wasp (Pseudomasaris vespoides). It is found throughout most of the world, but only in western North America. However, our local wasps are still beneficial to the gardener. While bees derive their protein needs from pollen, wasps meet their protein needs by preying on other insects and feeding their young this chewed up protein. Unless their nest is in an area where people or pets will come in contact with it, try to leave it alone and remember that wasps are beneficial insects too! Native wasps seen in our area include the bald-faced hornet (Dolichiovespula maculata), giant hornets (Vespa crabro), yellow jackets (Vespula species), paper wasps (Polistes fuscatus), mud daubers (Sphecidae or Crabronidae family), sand wasps (Bembix americana, Bembix pruinosa), great golden digger wasp (Sphex ichneumonea), and the cicada killer wasp (Sphecius speciasus). 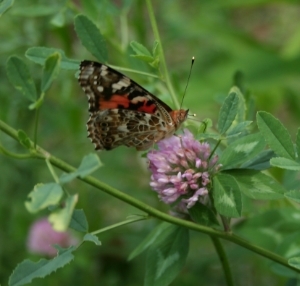 After bees, butterflies are the most well known pollinators. Massachusetts has a little over a hundred butterflies listed by Mass Audubon on their website - massaudubonbutterflyatlas.org. This list includes the swallowtails (family Papilionidae), the whites and sulphurs (family Pieredae), the gossamer wings (family Lycaenidae), which include coppers, hairstreaks, blues, elfins etc., the rare snout butterfly (family Libytheidae), the brushfoots (family Nymphalidae), which include fritilaries, checkerspots, tortoiseshells etc., the browns, wood nymphs and satyrs (subfamily Satyrinae/family Nymphalidae), milkweed butterfly (subfamily Danainae) which includes the monarch and queen butterflies, and finally, the skippers (superfamily Hesperioidea). Butterflies are the second best pollinators after bees. They do not have special pollen carrying structures like bees, but they are well able to do their fair share of pollinating flowers. 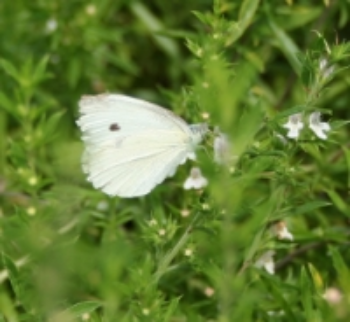 Butterflies perch to eat, so they prefer flowers with a landing platform. As they move around to find nectar, their long legs collect pollen. They make up for the smaller amount of pollen they carry by flitting from flower to flower, and covering more distance than bees do. Like butterflies, moths belong to the order Lepidoptera, and by far, outnumber butterflies. They are further divided and belong to the suborder Frenatae, Common moths include the banded woollybear caterpillar moth (Pyrrharctia isabella), giant leopard moth (ecpantheria scribonia), hummingbird moth (Hemaris sp. ), luna moth (Actias luna). Insectidentification.org for Massachusetts lists many other moths seen in Massachusetts. While butterflies and some moths are busy pollinating during the day, most species of moths take over after dark. Moths are more hairy than butterflies which help in pollination. Planting a moon garden made up of white or pale blooms will draw moths, as these flowers tend to almost glow in the moonlight. These plants also tend to be very fragrant and sweet smelling, an attribute night bloomers use to attract pollinators. Moths love tubular blooms which make it easy for them to drink the nectar. Another night pollinator is the bat. Unfortunately, the only bats that pollinate in the United States are in the southwest where they feed on agaves and cactus. Hummingbirds are the primary bird pollinators in the continental United States, and the only hummer in eastern United States is the ruby-throated hummingbird (Archilocus colubris). While the bird feeds on nectar, the pollen sticks to the feathers around the birds bill and face and is then transported to the next flower. It is not always necessary to feed hummingbirds - I have regular visitors every year to my petunias, hostas, coral bells, daylilies, foxgloves and beebalm among others. They like tubular, nodding and brightly colored flowers. Use single flowers, as doubles make it difficult for them to obtain the nectar. Incidentally, if you think you see a "baby hummingbird", it may be a hummingbird moth! According to Mass Audubon, there are two flies in Massachusetts that are pollinators. One is the flower fly (family Syrphiadae), which are excellent mimics of wasps, and the other is the bee fly. The bee fly (family Bombyliidae) looks like a bumblebee and although they do not have the pollen carrying structures on their legs like bees, they are fuzzy enough to pick up pollen and easily transport it to other flowers. For those who are chocolate lovers, the cocoa tree must be pollinated by midges (family Ceratopogonidae), small flies like no-see-ums. No midge, no chocolate. Beetles are one of our oldest pollinators and generally visit white to green colored bowl-shaped flowers. Here in New England, our oldest pollinators seem to prefer pollinating the descendants of those ancient flowering plants they pollinated 150 million years ago, primarily the magnolia and yellow water lilies. They also pollinate the paw-paw, sassafras, and sweet shrub. These plants are easily accessible to the beetle, and have adapted to the beetles damaging habits. The beetles in this area include the sap-feeding beetles (family Nitidulidae), leaf beetles (family Chrysomelidae), tumbling flower beetles (family Mordellidae) and weevils (family Curculionidae). Ants and slugs are not known to be very efficient pollinators. Ants visit inconspicuous, low-growing flowers that are close to the stem. Examples include stonecrop, spurge and penstemon beard tongue. Slugs occasionally pollinate plants - wild ginger is one example. One of the best ways to help pollinators thrive and beautify your yard, is to plant a native pollinator garden. Six native plants to grow as pollinators in Massachusetts. These include wild columbine (Aquilegia canadensis), wild lupine (Lupinus perennis), smooth swamp-milkweed (Asclepias incarnatal), birds foot violet (Viola pedata), wild geranium (Geranium maculatum) and goldenrods (Solidago species). The great variety in color, shape, and scent we see in flowers are a result of their association with their pollinators over millions of years. These various flower traits or characteristics which are associated with different pollinators are known as pollination syndromes, and are illustrated on the Pollinator Syndrome Traits Table. You can use this table to help you identify the potential pollinator you may see with different flower characteristics. Get to know your garden better this year. Grab a notebook and see how many pollinators you can identify. Utilize the Pollinator Syndrome Traits Table to decide on what types of flowers you want to plant to attract a specific pollinator, for example butterflies. But most of all, have fun! Selecting Plants for Pollinators. A Regional Guide for Farmers, Land Managers, and Gardeners in the Eastern Broadleaf Forest, Oceanic Province. Elizabeth L. Ley www.pollinator.org andwww.nappc.org (North American Pollinator Protection Campaign). www.fs.fed.us (United States Department of Agriculture Forest Service. 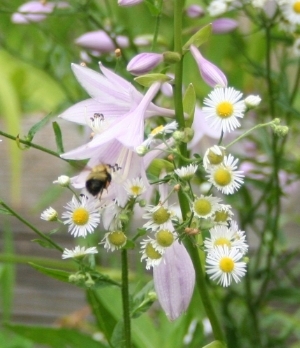 Wildflowers, pollinators, gardening, what is pollination, birds and bees, animals/birds, animals, unusual pollination, pollinator of the month, plant strategies, friendly practices). www.massaudubon.org (your great outdoors/six-native-plants-to-grow-for-pollinators, learn/nature-wildlife/insects-arachnids/bees-wasps/types-of-bees-&-wasps-in-Massachusetts).